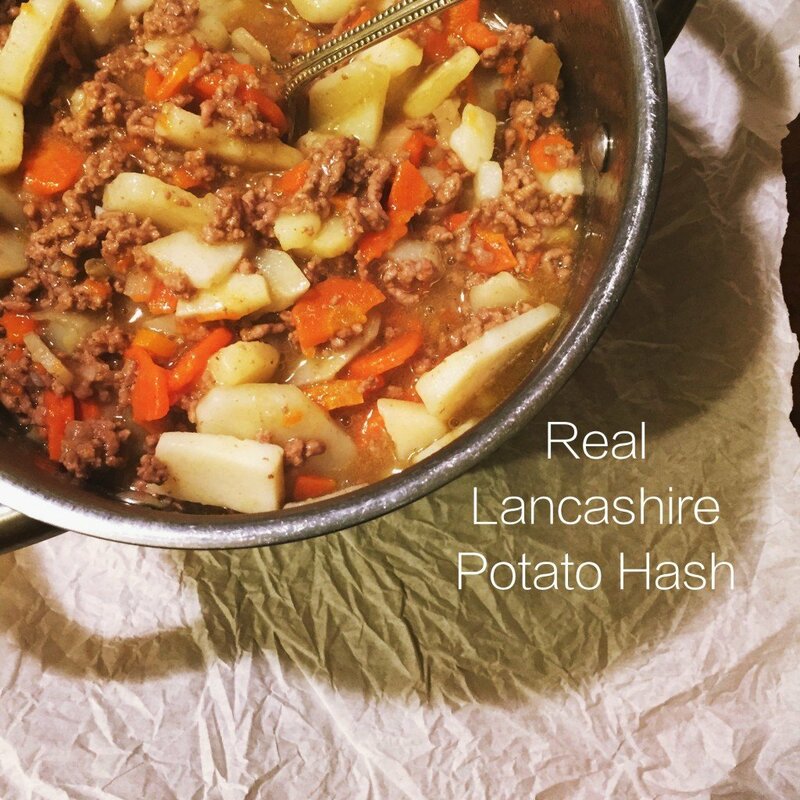 Lancashire hotpot was always a feature on the dinner table when I was a little girl and my grandma made the best hotpot ever! She’d grown up in Lancashire, was one of very many siblings and worked as a mill girl. Lancashire hotpot was originally a meal made by mill families as they could pop it in a big pot and leave it on low in the oven for the day so it would be ready to eat on their return from a long, hard day’s work. It’s women like her who knew just how to make the nicest traditional Lancashire meals, the ones that fed a large family of hungry mouths. I’ve played with her original recipe a little and added a few new flavours and also use the slow cooker which I’m sure she would’ve done too had it been around then! 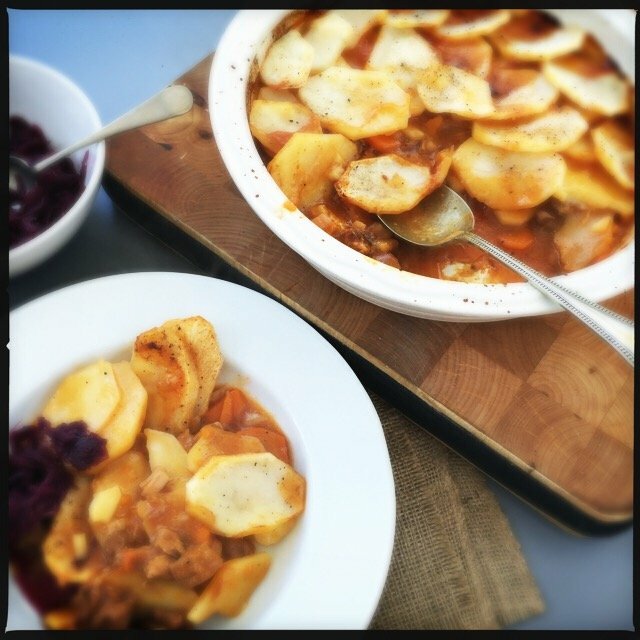 We cook the lamb stew part in the slow cooker, which you could if you wanted just eat as stew or you could add the traditional sliced potato topping and finish in the oven for that proper Lancashire hotpot northern treat. 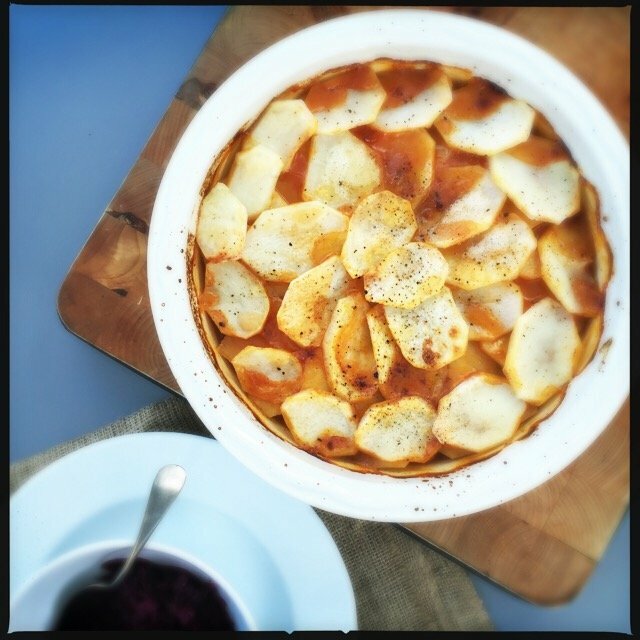 Hotpot is nicest served with a mound of pickled red cabbage and buttered crusty bread. Gently brown the lamb in a splash of olive oil. Add the onions, carrots and parsnips. Pour over the beef stock, add the Worcestershire sauce, tomato puree and chopped rosemary. Season with salt and black pepper. Bring the pan to the boil, then transfer to the slow cooker and cook for either 8 hours on low or 4 hours on high. If the stew is a little watery just thicken with a little cornflour stirred into a drop of cold water. To turn the stew into proper hotpot. Heat the oven to 190C. Transfer the hotpot to an ovenproof dish then top with the sliced potatoes. Dot the top of the potatoes with a little butter and bake in the oven for around 20 - 30 minutes until the potatoes are tender and browning on top. If you don’t have a slow cooker you can do the lamb stew part in the oven for 2-3 hours. You can also make the stew the day before and add the potato topping and cook in the oven the day you want to eat it. Just be sure the stew is properly heated through during the potato topping cooking.